It’s easy to decide what you’d like – the cost remains the same whether you want just the head or full body depicted, because the artwork area and therefore the amount of work will be similar. Please note that portraits are made to fit comfortably within a mount of the given size – the actual artwork area will naturally be smaller so as not be too near the edge of the mount. If none of these options are suitable – for example, you’d like more animals in one portrait, or a background added – please get in touch. I’d be happy to discuss any requirements or ideas you may have. Unless you have arranged to collect, postage is added to your balance invoice at current UK rates and items delivered by Royal Mail Special Delivery. Paintings can easily be sent worldwide shipped by Royal Mail Airmail, subject to different laws and costs. Please contact me for more information. This size of painting is shipped flat in a protective packet with mount and backing board, ready for you to frame or display as you desire. This size of painting is shipped in a protective cardboard mailing tube ready for you to have mounted and framed yourself. A digital image for your iPhone or Facebook! An optional, free optimised scan of your finished painting can be sent to you for sharing with friends on your iPhone or Facebook account. Please ask when booking. These make wonderful gifts in themselves. They’re also the perfect option if you don’t have enough time for me to do a painting by the date you need it, but you’d still like to have something to give as a gift. Please get in touch for more information. ‘Thank You for Two A4’ – FREE cards set! 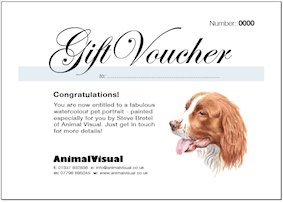 As a special ‘thank you’ if booking two A4 paintings together, you will receive 6 free Personalised Greetings Cards (see below) worth £10 – all of one, or 3 of each animal. Just contact me to let me know which you would prefer. Why not consider contacting a friend? You can both take advantage of the offer – 3 free cards for each of you! – and because I keep a digital scan of each animal (see Terms & Conditions) you can always order more cards when you run out! ‘Thank You for Two A3’ – FREE Prestige Pack! If you book two larger size paintings – size A3 and above – together, you will receive the Exclusive Prestige Pack for free! (see below) worth £35. Please note that both paintings must be booked at the same time, and that your extra ‘thank you’ items will be included with your order once the balance payment has cleared. A unique optional extra just for you! 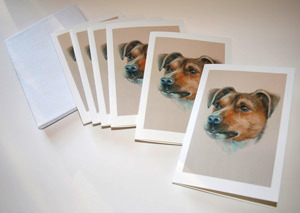 Digitally printed greetings cards with an image of your animal taken from the original pet portrait. These cards are left blank inside but you can have the name of your pet or a message included as part of the design on the front. Just ask. These are folded to A6 size and supplied with envelopes. One free pack is included if booking two A4 paintings – see above. £10 for a pack of 6 cards. One free pack is included if booking two A3 paintings – see above. Lots of options – hope to hear from you soon!